iConsometre - your consumption monitoring tool! iConsometre Your consumption monitoring tool! 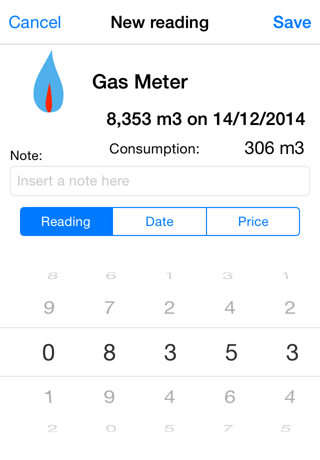 You can configure as many meters as allows the memory of your iPhone or iPod touch. The meters' list has 2 display modes: normal and compact. You can add a reading to any meter by a tap on its + button in the list. You can add as many meters as you want or need. 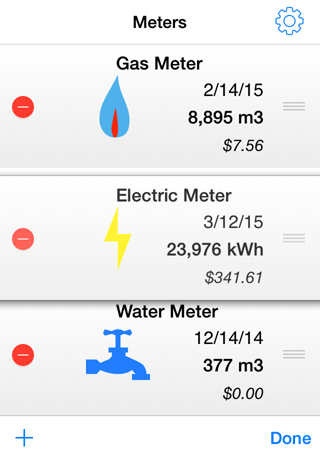 iConsometre let you create meters until it consumes the memory of your iPhone or iPod touch. iConsometer offers a large set of meters' type. 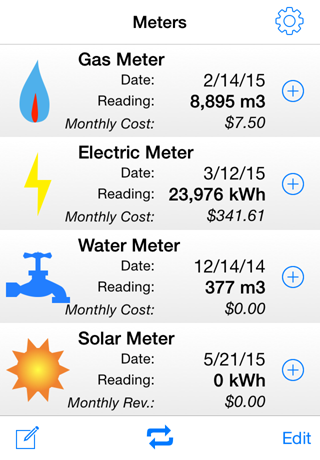 In addition to the usual water, gas and electricity meters, iConsometre proposes solar and windpower meters. Organize your meters as you wish! You can rename and reorder your meters as you wish. iConsometre automatically adjust the date when you make a new reading; it shows latest reading value; it prevents from erroneous input. You can even add a note and prices changes at each reading. Data could be visualized in graphic that can be displayed in full screen when switching to landscape the reading list. 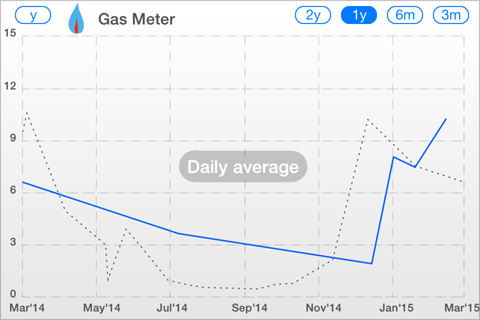 You could visualize the data for the past 3, 6, 12 or 24 months with or without year-to-year. You modify displayed data type by a double tap on the graphic. The selection of a meter from the main screen displays its readings list. The readings list shows estimation of consumption or cost. 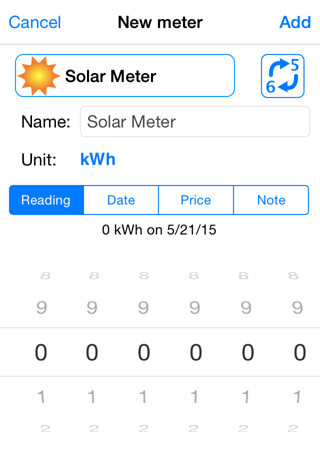 You can add or delete readings by a tap on the + button or a swipe of a reading. Monitor your consumption to prevent waste! 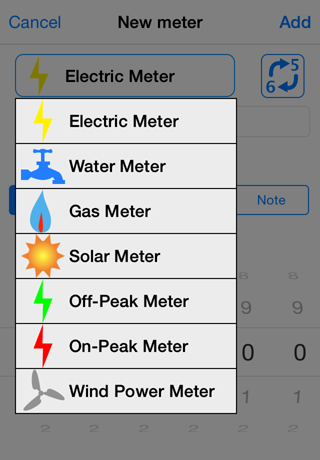 Keep a close track of your electricity, water and gas consumption or your solar or windpower production with iConsometre, an application designed for iPhone and iPod Touch. Enter new readings (use the “+ “button on the right of each meter, the date is set automatically to today’s date, then save). Program daily, weekly or monthly reminders. The first time you use iConsometre, learn how to use the application with the example data available. 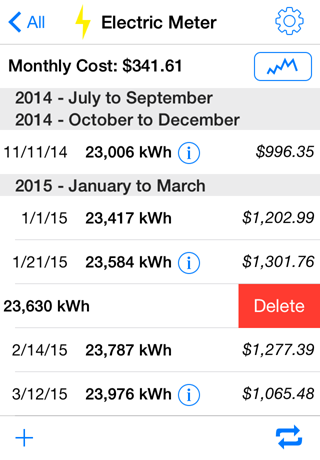 When you are ready, simply delete the example data, create your own meters and enter your own readings. Send your questions, comments and wish list via the iConsometre support page. Reading notifications propose two options: either to read the meter or to delay the notification to the next day. Complete rotations of meters behave correctly when lower reading are authorized. This version is available for iOS 8 and 9 and it corrects an issue with notifications in iOS 9. This version is only available for iOS 8. Version 1.2.2 remains available for earlier iOS release. Corrections of a few bugs that could lead to application crash. correction of three minor issues. and many other improvements and corrections.